The equity-based destination club recently released the highlights from its annual survey of members and a summary of their travel activities. The club also extended its lower introductory pricing. The basic idea of destination clubs is to provide large spacious homes for travelling with extended family and friends. The A&K member travel patterns certainly bear this out: 91% of members are likely to travel with their spouse or direct family to club homes; 81% of members travel with friends, and 32% travel with extended family like grandparents. Considering future home locations, the A&K member's top preference is to add beach destinations, followed closely by additional urban locations to the portfolio of homes. This mirrors most of the other destination clubs, where the beach locations are always the most popular and urban residences tend to be consistently used throughout the year - weekend trip to New York anyone? Members of A&K Residence Club can also exchange some of their club nights towards parent company Abercrombie & Kent tours. The destinations of most interest for the club members include New Zealand, China, Europe, Antarctica, Galapagos, Africa, Greece and India. 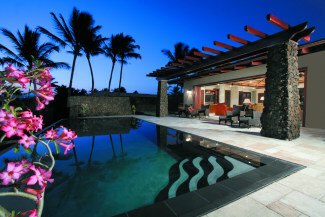 Members voted Hale Pu'uhonua on the big island, Hawaii as the best home of 2009, Located a short distance from the ocean swells and white sand beaches of Hawaii's big island, Hale Pu'uhonua is a spacious four-bedroom island getaway located in the Mauna Lani Resort on the Kohala Coast. Part of the prestigious Champion Ridge subdivision, the residence is part of the only residential development in Hawaii designed around an 18-hole putting course. Perfect for large groups of family and friends, it boasts separate entrances to each suite as well as an epicurean kitchen, heated pool, outdoor shower and fully-equipped theater room. Upscale island decor, including thatched ceilings and mahogany trim throughout, sets the mood for a relaxing vacation in one of the Big Island's sunniest and most beautiful areas. I could stay there, and have, over and over again...we've had tons of great times there and have memories to treasure for a lifetime." Marco Hernandez, destination host in Los Cabos, Mexico was voted the Best Host of 2009. Members cited his attentive service, "can-do" attitude and availability to assist members with dining reservations. He anticipates the needs of each family, preparing the home with personalized amenities including an authentic Mexican welcome with a pitcher of Margaritas, homemade Pico de Gallo and Guacamole on arrival. Club member Allen Willis wrote, "He is very knowledgeable about the area and always ready to make our experience something special. All the little things that arise when traveling with a large group are always taken care of with a 'not a problem, no big deal' attitude." The club reduced its membership pricing a few months ago and is extending this limited-time pricing on memberships through June 30, 2010. Membership pricing will reset with a 7% increase on July 1, 2010. "There has never been a better time to join the Club," says Abercrombie & Kent Residence Club President Scott Wiseman, "and we expect many two-year trial members to convert before the deadline." "Interest in the Club was very strong in the first quarter, exceeding total membership sales in 2009, with more than a dozen prospects in the final stages of joining," explains Scott. "This extension will give them the time they need to make a commitment before the July 1 price increase."